Published on October 29, 2016 by Martyn. Be the first to comment! 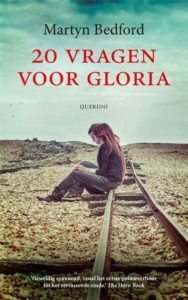 Twenty Questions for Gloria was published in translation in the Netherlands this week, so I thought I’d share this striking cover image of the Dutch edition. It’s published by Querido Kinderboeken, the specialist children’s and young-adult imprint of Querido, a prominent Amsterdam-based publisher which celebrated its centenary last year. I’m especially grateful to the translator, Tjalling Bos, for bringing my novel to a Dutch readership.